I’ve been doing a lot of travel the last few years and have gone through a lot of airports. 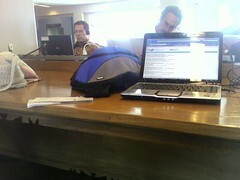 There are huge variations in quality from airport to airport and even within terminals of the same airport. A few stand out. Open, airy spaces. I’m going to be crammed in a metal tube for hours. I don’t want to be crammed in the airport, too. Well-managed security lines. Atlanta (ATL), Denver (DEN) and Washington Dulles (IAD) go on the hate list for this reason alone. Reasonably priced food with options for healthier eating than burgers and pizza. A big plus for airports that promote local restaurants. Free WiFi and easily accessible power ports. Most large airports don’t have free WiFi (the better to soak business travelers), but a lot of the mid-market and small airports do. Convenient public transit options to the city. 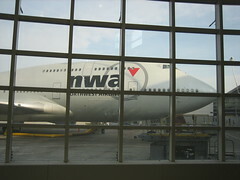 Big windows to watch airplanes from. Service from airlines that I’d want to fly. Public art installations. They add character and provide a pleasant diversion when flights are delayed. None of the airports on this list excel at all of these things, but as a whole each airport stands well above average. This list is also available as a Google Map. 10. Albuquerque International Sunport – A great mid-market airport. It’s one of the few that I’ve seen that have free WiFi and desks with power plugs that are open to all passengers. The restaurants have a strong local flavor. 9. San Francisco International Airport (SFO) Terminal 3/International Terminal – SFO, much more than most airports, has really highlighted local restaurants in its terminals. They aren’t cheap (but then it’s San Francisco, so they aren’t cheap in the city either), but do give travelers a good taste of the city. I recommend the Boudin Bakery in Terminal 3. Terminal 1 food options are lacking. SFO also features a rotating selection of art, though I have to question the recent display of clock art. The confusing, expensive and poorly executed public transit from the airport is my biggest knock against it. It could be much better, but BART has taken a soak-the-travelers attitude. 8. Incheon International Airport (ICN) Seoul – An architecturally impressive airport with first-rate amenities, including a spa. Like Seoul itself, the airport is littered with American fast food chains. Unfortunately the airport is a long way from the city and Seoul’s brutal traffic makes it seem even farther. 7. Minneapolis-St. Paul International Airport (MSP) Lindbergh Terminal – Clean, easy and efficient. Navigating the sprawling tentacles of the airport is made easier with clear signage and trams, but if you’re connecting, you could be in for a lot of exercise. A few Minnesota favorites such as D’Amico & Sons, Dunn Bros Coffee and French Meadow Bakery are sprinkled in among the airport chains. The new light-rail line takes you downtown or to Minnesota’s biggest tourist attraction – the Mall of America – for $2.25 or less. Minnesota’s harsh winters often mean long waits for deicing or missed connections, but I haven’t had the nightmarish experiences of O’Hare here. 6. Detroit Metro Airport (DTW) – Detroit gets the prize for most improved airport, moving from worst to not-quite-first. The McNamara Terminal is architecturally impressive and has great views of planes. It’s daunting length is reduced by the Express Tram, which provides a birds-eye view of the terminal as it goes from one end of the terminal to the other. The light show in the tunnel between the A and C concourses can be entertaining. The Westin is one of the nicest airport hotels in the country, with its own security entrance. Restaurants are on the chainy side. 4. Charlotte Douglas International Airport (CLT) – Charlotte has wonderful public spaces, free WiFi and power plugs next to comfy rocking chairs. The last time I was through CLT, there was even a piano player. The food court includes local barbecue options. Charlotte would probably be my favorite airport, but it has one big drawback: the dominant carrier is US Airways. 3. Vancouver International Airport (YVR) – You’ll know you’ve landed in the Pacific Northwest when you arrive at YVR. The entry from international flights is one of the most impressive welcomes I’ve seen in an airport. 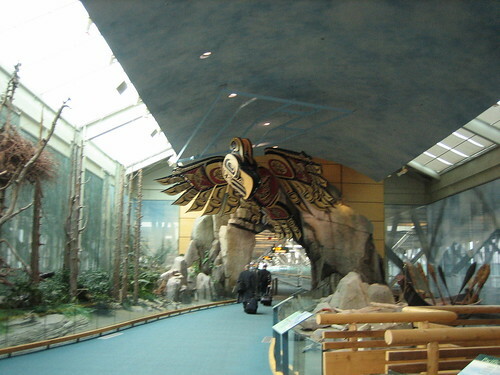 It wouldn’t be hard to think of YVR as a Native American history museum. Some of the art on display is on loan from museums. Free WiFi is also a plus. The Canada Line mass transit system linking the airport to the city should be opening any day now. 2. Washington National Airport (DCA) Terminals B & C – Wealthy Alexandria neighbors, overblown security concerns and the idiotic perimeter rule keep more people from experiencing this terrific, underutilized airport. Terminals B & C are clean, modern and airy. They feature amazing views of the Capitol and the Washington Monument across the Potomac. The views from Continental’s Presidents Club are especially impressive. Dining is much more chain-oriented than I’d like, but I do try to hit the Five Guys when I’m there. A covered walkway takes you to the Metro which connects you to much of the DC area. Security lines are usually not an issue. The biggest knock: Terminal A, the original airport. A lot of third-world nations would disown it. 1. 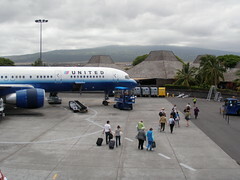 Kona International Airport (KOA) – OK, the deck is stacked here. A big part of the reason that Kona is my favorite airport is that when you land, you’re in Hawaii. The approach from the mainland includes a view of neighbor island Maui, goes over turquoise water and you land on a lava flow from 1801. (Look out for messages in white coral on the lava.) But the airport itself has a lot of charm. There’s a little bar tucked away in the corner. There aren’t big windows to see the planes, but that’s because everything is open air, letting you get up close and personal with the planes. (Just don’t take a lot of pictures like I did or you might be interrogated.) Food options at this tiny airport are limited. I was too distracted by the beauty to check if there is free WiFi. Two other international airports that I really liked are Kuwait International Airport (KWI) and Schipol (AMS) in Amsterdam. My last visits there were too far in the past to include in this list. And for those who are wondering, here’s the hate list in no particular order: ATL, DEN, BOS, IAD, LGA, JFK, LHR, ORD, MIA, SJC, OAK, FRA, IAH, MSY, CDG. 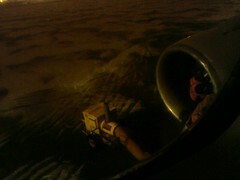 This entry was posted in airlines, travel. Bookmark the permalink. I’d have to say I agree with you on your list, especially the new Detroit Metro. Isn’t that a great airport? I would add into the hated list: George H.W. Bush Airport in Houston, Sheremetyevo in Moscow. With you on most of those, and especially on YVR. Any airport considering a redesign/new terminal should take a trip through there, first. Do not forget Tampa International Airport. It is not that fancy but work as a clock! Also Fort Lauderdale International Airport, it is overcrowded but has oine of the cheapest fares arouund the world thanks to spirit Airlines. What about DFW’s International Terminal? It is pretty amazing.